Members meet monthly, give community presentations, enjoy group activities and have fun! Retirement usually brings time for travel, grandchildren and hobbies, along with new ventures such as second careers or nonprofit volunteering. But perhaps in retirement you miss collaborating with medical colleagues, and would like to interact with other physicians about current medical issues or other matters of interest. If so, the Retired Physicians of the Kansas City Medical Society have something for you. The Retired Physicians, formerly the John Locke Society, provide a variety of activities for retired physicians of all specialties. Any retired or partially retired physician is encouraged to participate in any or all of our activities. Here is a summary. Retired Physician members enjoy giving educational presentations to groups around the metropolitan area. Since 2011, the group has offered “Talking With the Doctor,” a speakers bureau of member volunteers. So far in 2018, over 50 health topic presentations have been given to approximately 1,250 participants in multiple community venues in the Kansas City area. People with the greatest health care needs often have difficulty communicating with their physician or other health care professionals. The “Talking With the Doctor” program helps individuals broaden their understanding of health issues and develop their abilities to make the best possible health care decisions. The program also advises them on how to seek appropriate medical, financial and social service assistance. The Retired Physicians plan to expand their speakers bureau to meet the increasing number of requests for health topic presentations. If you would like to participate in our program by offering to present talks on medical subjects in your area of expertise, feel free to contact us to volunteer your services. You will find speaking to groups to be an enjoyable experience, and you will be giving back to the community. Guided monthly tours at the Nelson-Atkins Museum of Art provide an intellectually stimulating cultural experience for our retired doctors. Tours usually occur on the third Wednesday of the month with an optional lunch in the museum prior to the tour. Our docent guide provides insight into different artistic genres as we view various works in the Nelson-Atkins collection. Significant others and guests are welcome and there is no charge. Every session leaves us more enlightened and appreciative of fine art. 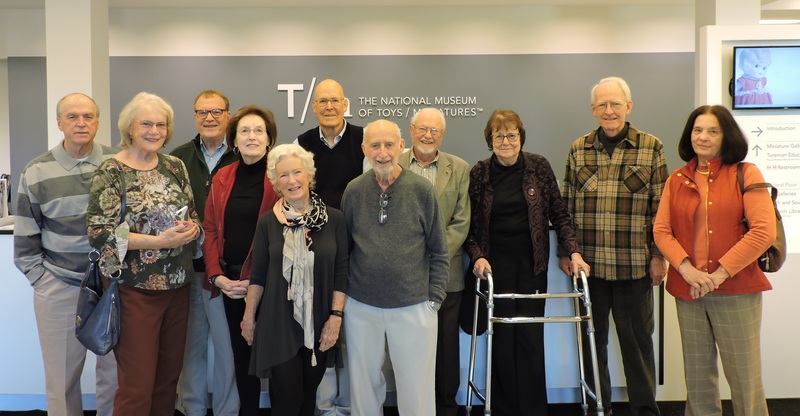 Occasionally, we may tour other museums like the National World War I Museum, the Kemper Museum of Contemporary Art, the Truman Library, the National Museum of Toys and Miniatures, and others. As a group, we are able to obtain guided tours which provide extensive and valuable insight into the collections viewed. We welcome any retired physicians to join us for these stimulating visits to some of our local treasures. Are you ready to sit down with fellow physicians of about your same age and enjoy conversation over a good meal or a nice glass of wine? This is where retired physicians can enjoy socializing with others while dining in some of Kansas City’s finer restaurants. Every month or two, we get together at a chosen restaurant for lunch or dinner with a glass or two of wine and some light conversation. Retired Physician members are represented by Keith Jantz, MD, on the newly formed Kansas City Medical Society Leadership Council. Representation on the Council contributes the retired physician perspective to the direction of KCMS, and helps retired members remain abreast of Society activities and policies. The group also supports the Osler Society and its engagement with medical students on the University of Kansas Medical Center and University of Missouri-Kansas City campuses. By offering strong support of the Osler Society through continued dialogue with administrations of both medical schools, Retired Physicians strive to ensure the continuation of the Osler Society as a benefit to active medical students. If you are interested in joining in Retired Physician activities, or if you know a retired physician in the metropolitan area who would like to join us, please get in touch with us through KCMS. The Retired Physician board meets on the first Tuesday of each month, and non-board members are welcome to attend meetings and planning sessions for future activities, as well as all activities of the organization. For more information on the Retired Physicians group, contact Jesse Osman at josman@kcmedicine.org, or visit the KCMS website at www.kcmedicine.org and look for “Retired Physicians” under the “Community” main menu item. Through participation as Retired Physicians, members benefit from cultural improvement and gain a connection with the medical careers all have enjoyed. Keith Jantz, MD, is a retired internist from Overland Park. Jesse Osman is director of membership for the Kansas City Medical Society. He can be reached at josman@kcmedicine.org.